Main source: McGavin (cited on main Arthropod page), p. 217. 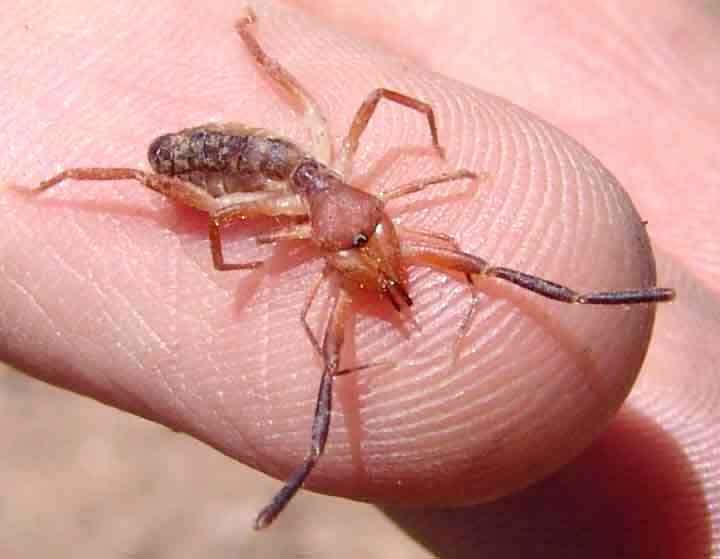 Windscorpions, also called "Sun-Spiders", though this seems inappropriate, since the term "solifugid" means "sun-fleeing", and see below their typical habits. 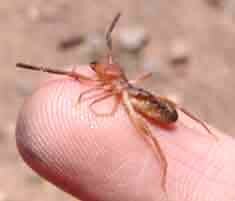 The Solifugae constitute an Order within the Class Arachnida, separate from either Spiders or Scorpions. 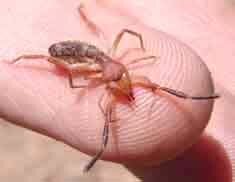 The 12,000+ species of the Order Solifugae have a flexible abdomen that narrows where it joins the three-sectioned cephalothorax, and a head with a pair of small eyes. They are predators, using very large, pincer-like chelicerae -- paired, jointed jaws that house fangs or fang-like mouthparts to kill and tear up their prey. In the Solifugids, these fanged jaws are huge relative to the size of these animals, which ranges from the small specimen shown below to literally scary monsters more than 5 inches in length. Below, a specimen of the family Ammotrechidae, a quite variable but mostly small (less than an inch) group of Windscorpions, most of which are nocturnal, though some are active diurnally as well. 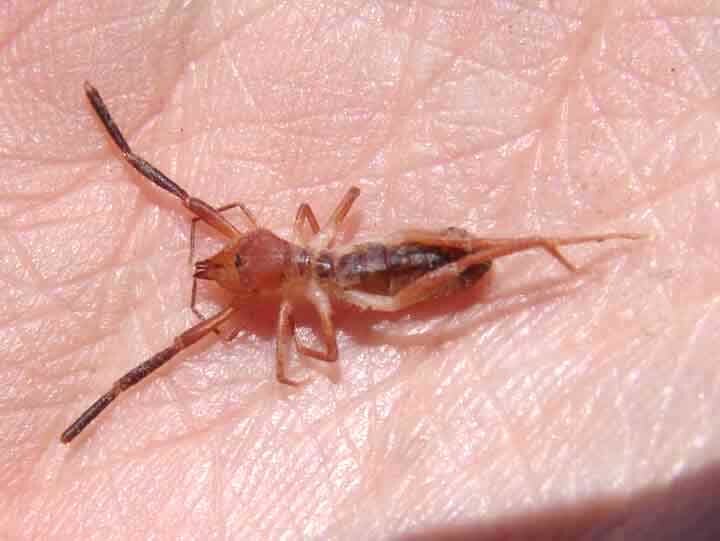 We found this unfortunate Windscorpion drowned in a bowl of rainwater in Lower Hot Springs Canyon. Length of the head and body portion is about 1/2". In the enlargements, the eyes and the massive chelicera show up best in the right-hand image, while the slender, flexible abdomen and the long, clawless, leglike pedipalps stand out in all three images. Solifugae use these pedipalps, which are equiped with suction pads, to grasp the small vertebrates and arthropods which are their prey. We have seen, but not yet photographed, much larger Windscorpions in our area. One appeared on a brick floor late one night, clattering rapidly and rather loudly along with head and pedipalps held high like a miniature Minotaur -- the pedipalps held apart like a pair of arms and the four legs marching quite rapidly. It was about 2" in length but looked larger and confrontational, before it beat an equally hasty retreat in the glare of the light. This is a typical pattern of behavior for Solifugae -- the large head is held high, and the long hind legs of the animal enable it to move at higher speeds than other Arachnids. Their "Windscorpion" name may relate to the fact that some can move as fast as an ordinary human being can run for short distances. See http://www.nationalgeographic.com/magazine/0407, and look under "July 2004 Features" for more images and details.